Name: Abby-Roo. The addition of "-Roo" to her name can be attributed to her fluffy rooster tail. 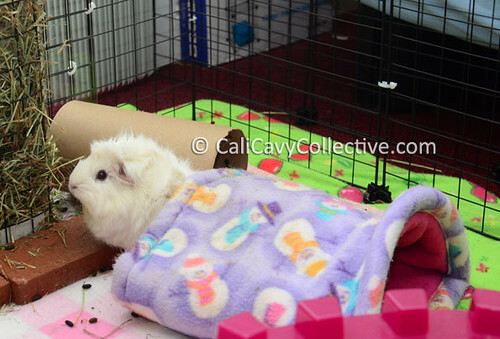 Story: Abby-Roo was rescued by Cavy House after being abandoned at a shelter. Our humans readily adopted her after it became apparent that she and Revy would get along as cagemates. Abby-Roo enjoys being petted and purrs every time her rooster tail is tickled. She is not particularly fond of trying new foods and prefers to stick to familiar treats. Leave the adventurous eating to Revy! Abby-Roo's little white shark fin can be seen zipping around the cage whenever she decides to sprint laps. She tells us she has plans to dress up as a shark for Halloween to keep Revy on her toes. 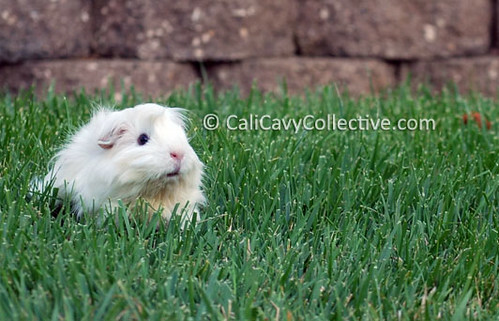 Abby-Roo is a very cute little pig, I hope she and Revy will be very happy together. My girlfriend LOVES Abby-Roo! She calls her Bianca. She is a PERFECT PIGGY! Haha, Abby-Roo-Bianca says thank you!